After our lunch at Go Greek! 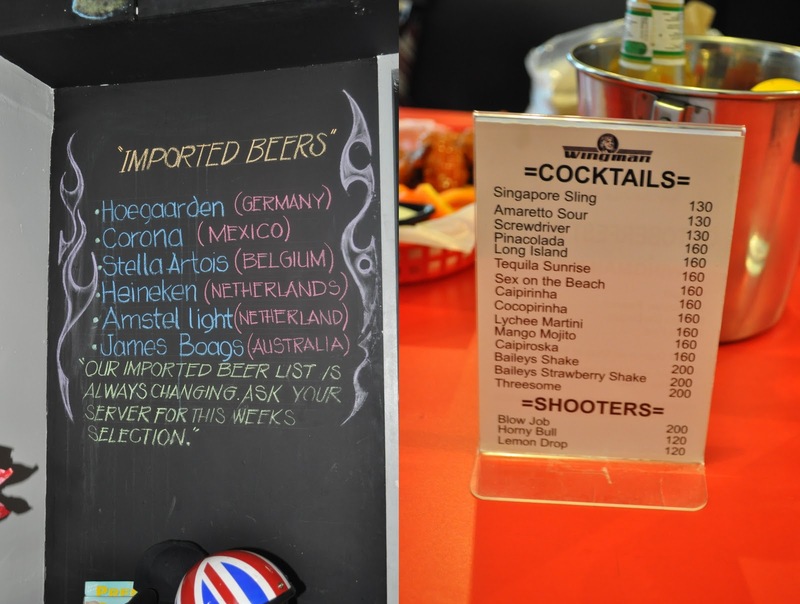 last Saturday, we went to The Collective in Makati to try out Wingman. Upon entering, we noticed a TV show projected on the wall. It was a game of football showing in AKTV channel. What a great added feature of Wingman to its customers. 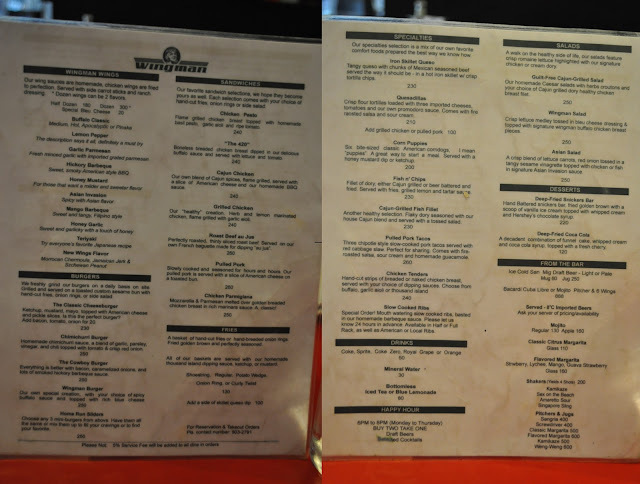 The menu was written on a chalkboard just above the counters, but we were still given a menu for their complete and detailed offerings. We asked the waitress the best-sellers for their wings and she recommended the Buffalo Classic, Lemon Pepper, and Garlic Parmesan. The Buffalo Classic Hot was spicy and the sizes of the wings were quite small. It came with carrot sticks and a Bleu cheese dipping sauce on the side. I would still choose Charlie's Hot Buffalo Wings over this one. The name Lemon and Pepper wings says it all. It was basically fried wings sprinkled with lemon and pepper powder. I like this more compared to the Buffalo Classic but I would not say that I loved it. I found it dry and simple. The Lemon and Pepper powder tasted like a Chinese spice I tasted before. I just don't remember what it was. I guess we ordered the wrong flavors for our wings, but we would definitely be back to try the other flavors. For their burgers, we tried the Home Run Sliders (P250). It's an order of 3 own choices of mini burgers from their menu. We got the Chimichurri Burger- homemade chimchurri sauce made from blended garlic, parsley, vinegar and chili topped with tomato and red onion. Cowboy Burger- bacon, caramelized onion with lots of smoked hickory barbecue sauce. This is a great choice for first-timers like us because we get to sample 3 kinds of burger in one order. But the Home-run award goes to The Cowboy Burger! We loved everything about it especially the bacon and sweet hickory barbecue sauce. Will definitely order the bigger version of this on our next visit. Next, we also ordered for the Iron Skillet Queso (P250) which is melted cheese with ground beef served in a hot metal skillet. The sauce was tangy with a kick of spice. What other way to eat the crispy tortilla chips but to scoop it into the hot and melted cheesy goodness. 6 halves of chipotle style slow-cooked pulled pork with cabbage and carrot slaw wrapped in toasted soft tacos. Just by describing the dish made me want to eat this again today. It also comes with fire-roasted salsa and sour cream on the side. The Collective 7274 Malugay St.
Ang daming food! They all look yummy :) I'd love to try those wings and burgers. Daming flavors ng wings nila. Too bad we got the wrongs orders. I think mas ok ung ibang flavors kesa dun sa nirecommend nung waitress. Soi- Eat Thai. Love Thai. Not Soi Much.